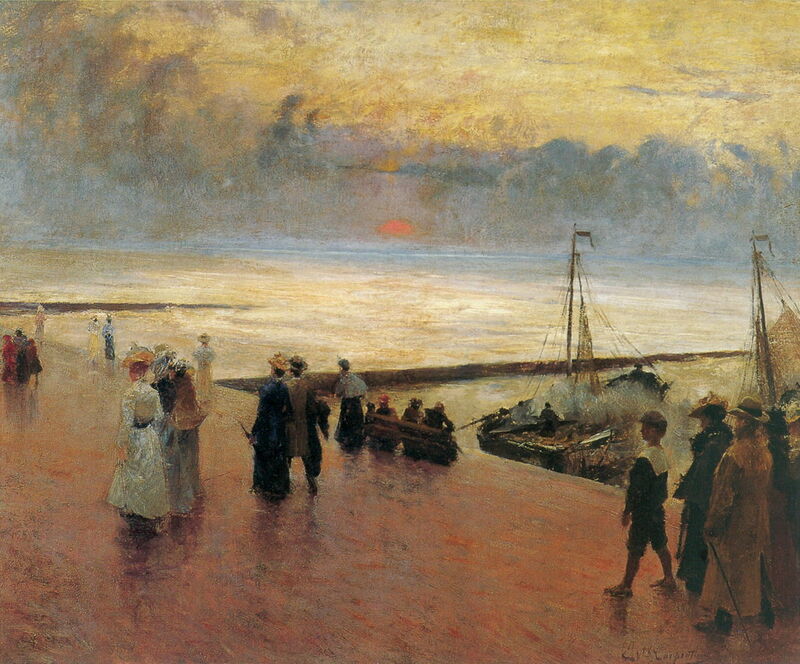 Évariste Carpentier (1845–1922), Sunset at Ostende (date not known), oil on canvas, 63 x 76 cm, Private collection. Wikimedia Commons. 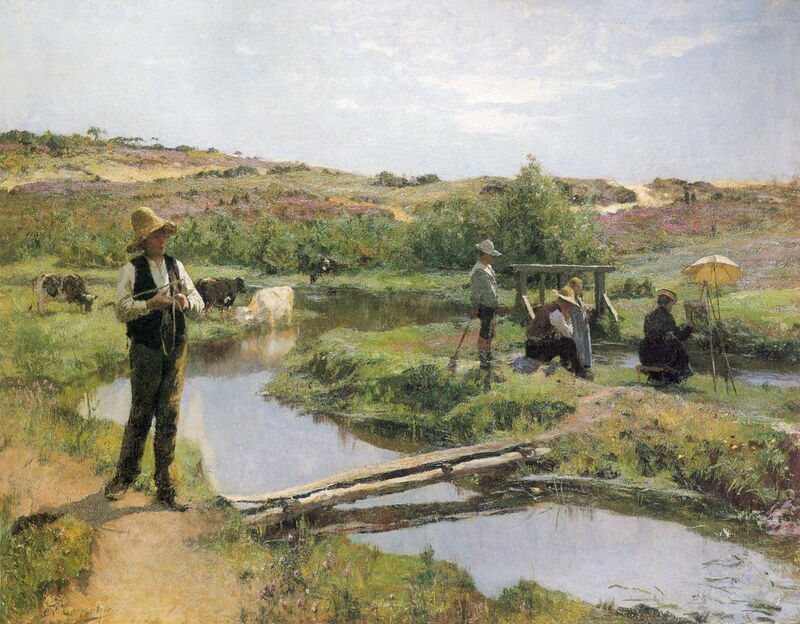 By the end of the 1880s, the Belgian painter Évariste Carpentier (1845–1922) was painting Naturalist works inspired by Jules Bastien-Lepage, showing rural deprivation. 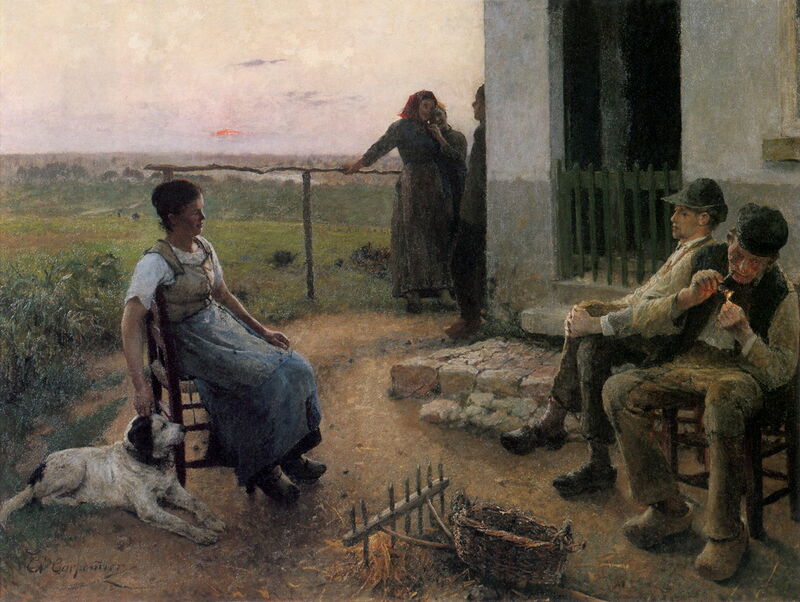 Évariste Carpentier (1845–1922), After Work (c 1890), oil on canvas, 90 x 130 cm, Private collection. Wikimedia Commons. During the 1890s, with Naturalism more generally on the wane, Carpentier’s themes and style started to become more Impressionist and idyllic. The country people shown in After Work from about 1890 are sat around as the sun sinks slowly to the horizon. 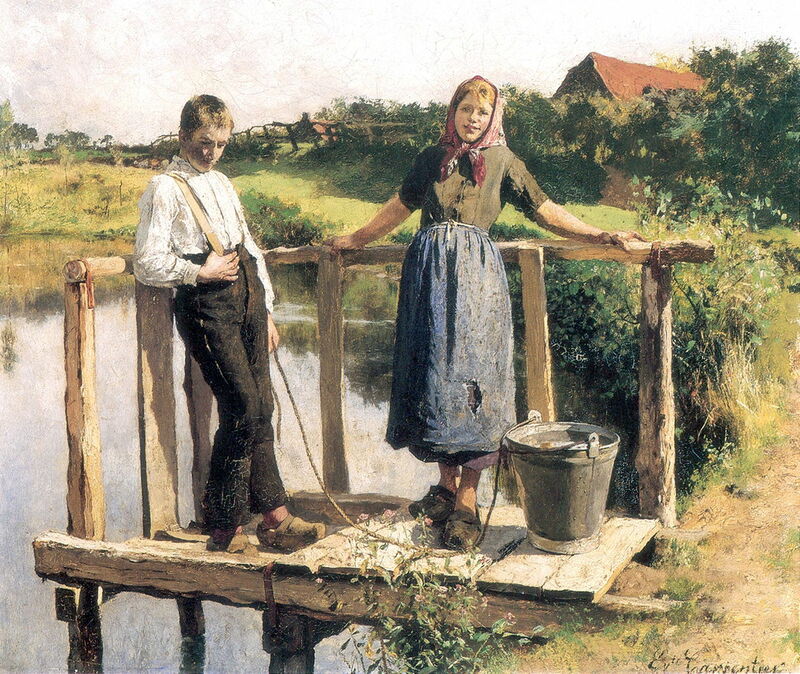 Évariste Carpentier (1845–1922), The Turnip Washer (1890), oil on canvas, 130 x 195 cm, Musée des beaux-arts de Liège, Liège, Belgium. Wikimedia Commons. The Turnip Washer from 1890 is among the last of his thoroughly Naturalist paintings. 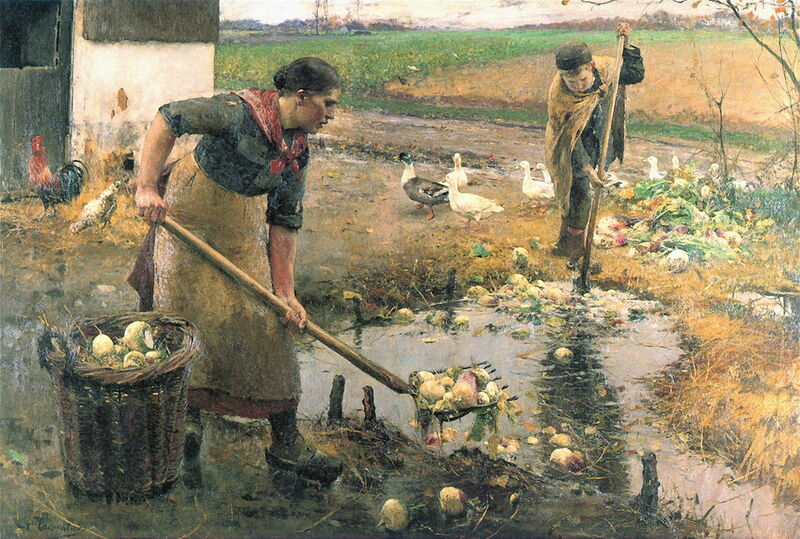 Alongside the farmyard birds, two figures are busy washing piles of turnips in a small and dirty pond. This won Carpentier a medal when it was exhibited in Paris. Évariste Carpentier (1845–1922), Intimate Conversation (c 1892), oil on canvas, 50.5 x 60.5 cm, Broelmuseum, Kortrijk, Belgium. Wikimedia Commons. Intimate Conversation from about 1892 is another stock Naturalist theme, of a young couple talking idly outdoors in the sun. Carpentier avoids the controversial issues which marred Bastien-Lepage’s earlier painting, and puts a prominent tear in the young woman’s apron to emphasise their poverty. This also marked the start of increasing sentimentality in his paintings. 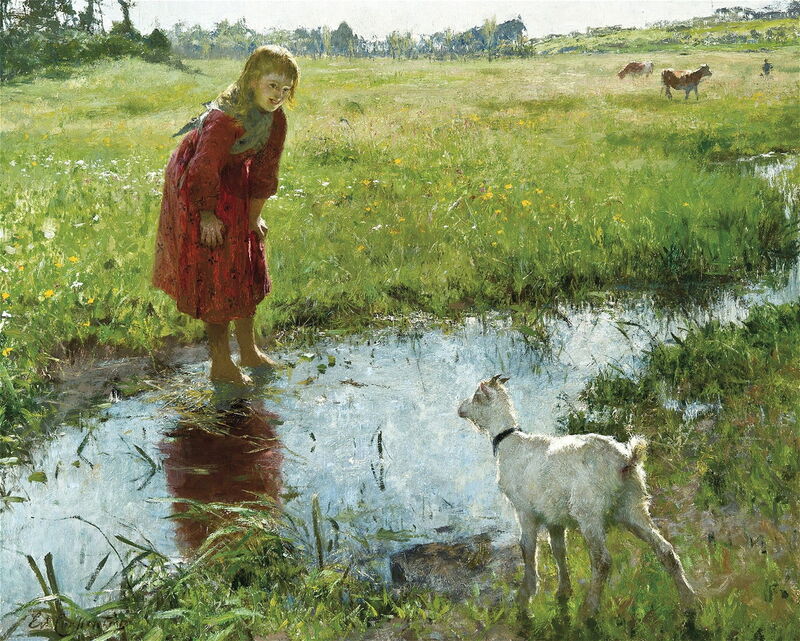 Évariste Carpentier (1845–1922), Wild Friend (c 1893-95), oil on canvas, 65 x 81 cm, Private collection. Wikimedia Commons. Carpentier’s Impressionist Wild Friend from about 1893-95 is more painterly, higher in chroma, and has lost the objectivity of his earlier Naturalist paintings. Given the dense marks across the meadow, this seems unlikely to have been painted in a single session in front of the motif. Évariste Carpentier (1845–1922), On Holiday (c 1890-95), oil on canvas, 75 x 106.5 cm, Musée Fabre, Montpellier, France. Wikimedia Commons. 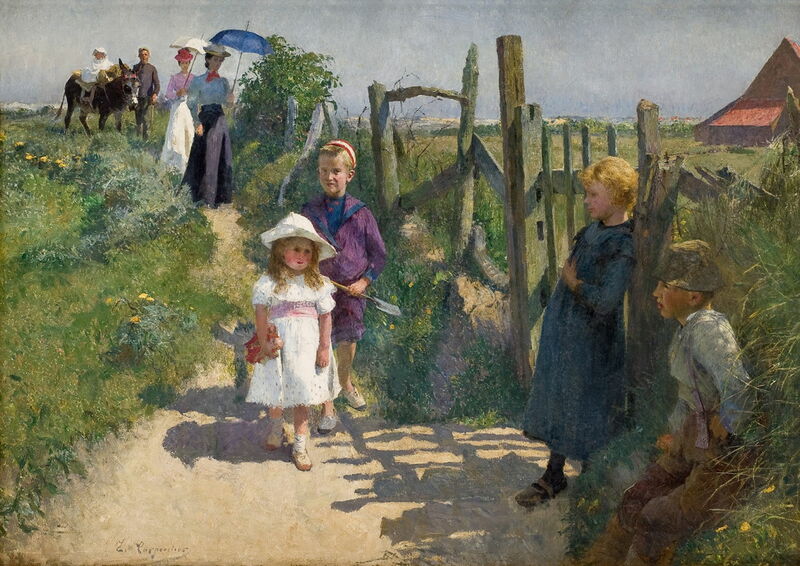 On Holiday is thought to have been painted between about 1890-95, when Carpentier himself had a young family, and may be a portrait of his wife and children dressed up for an outing to one of the beaches on the Channel or North Sea coasts. 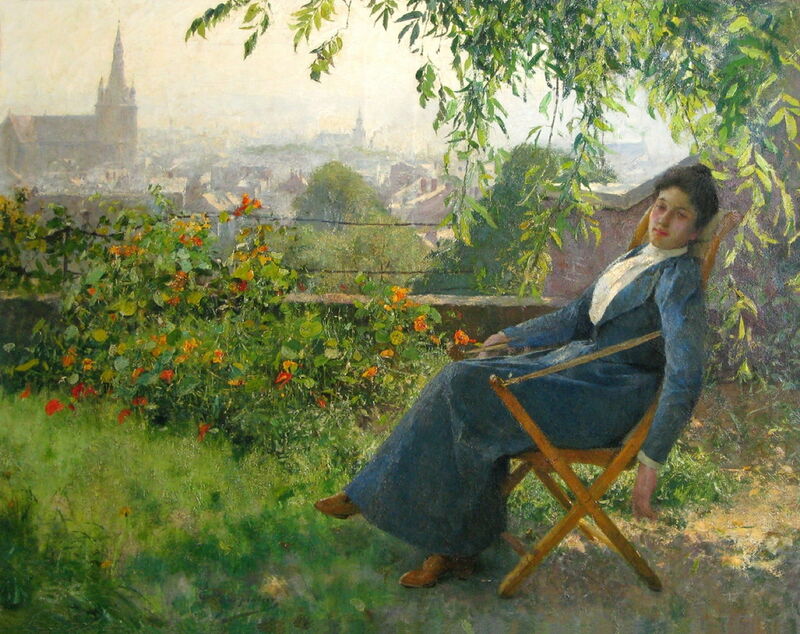 Évariste Carpentier (1845–1922), Siesta (c 1897), oil on canvas, 65 x 81 cm, Musée communal de Huy, Huy, Belgium. Wikimedia Commons. I similarly suspect that his model for Siesta from about 1897 may be his wife Jeanne. 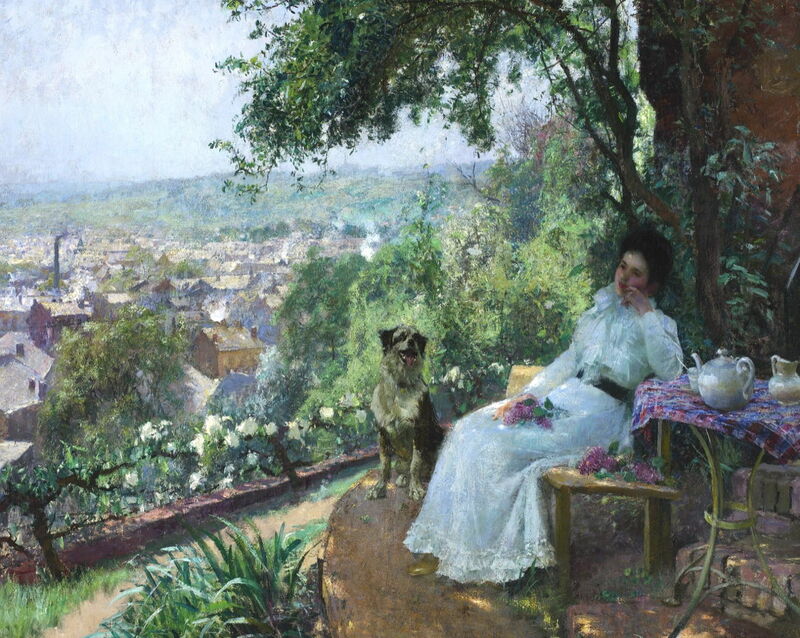 This is a composition which was popular with Impressionists and other painters in the late nineteenth century: a woman seated in the sunshine overlooking a backdrop of a town, which may be Liège, perhaps, to which he and his family moved that year. 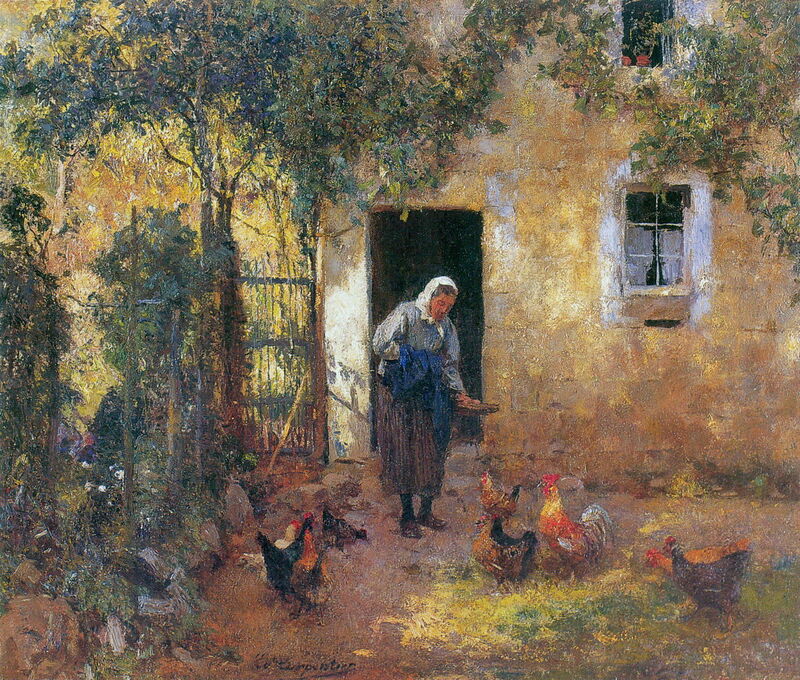 Évariste Carpentier (1845–1922), Feeding the Chickens (date not known), oil on canvas, dimensions not known, Private collection. Wikimedia Commons. His undated view of an old woman Feeding the Chickens in her yard appears to have been painted at around this time. Évariste Carpentier (1845–1922), Child Playing (before 1900), oil on canvas, 45 x 38 cm, M-Museum Leuven, Leuven, Belgium. Wikimedia Commons. 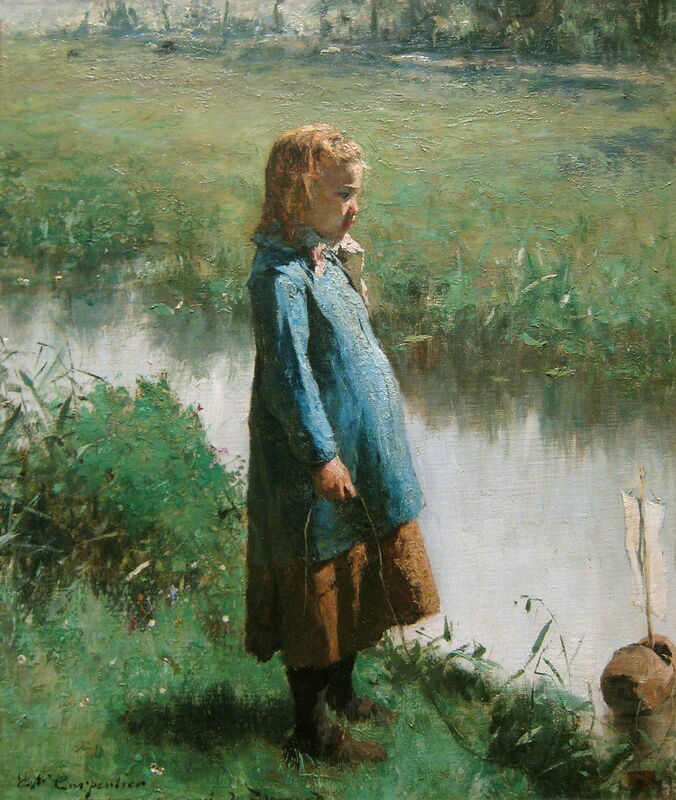 Child Playing is claimed to have been completed before 1900, and shows a young girl, possibly one of his own daughters, playing with an improvised sailing boat made from a wooden clog. In 1897, Carpentier was appointed professor of painting at the Royal Academy of Fine Arts in Liège. There, he introduced many students to Impressionism and Luminism. Évariste Carpentier (1845–1922), Place Saint-Jacques in Liège (c 1900), oil on canvas, 60 x 73 cm, Private collection. Wikimedia Commons. 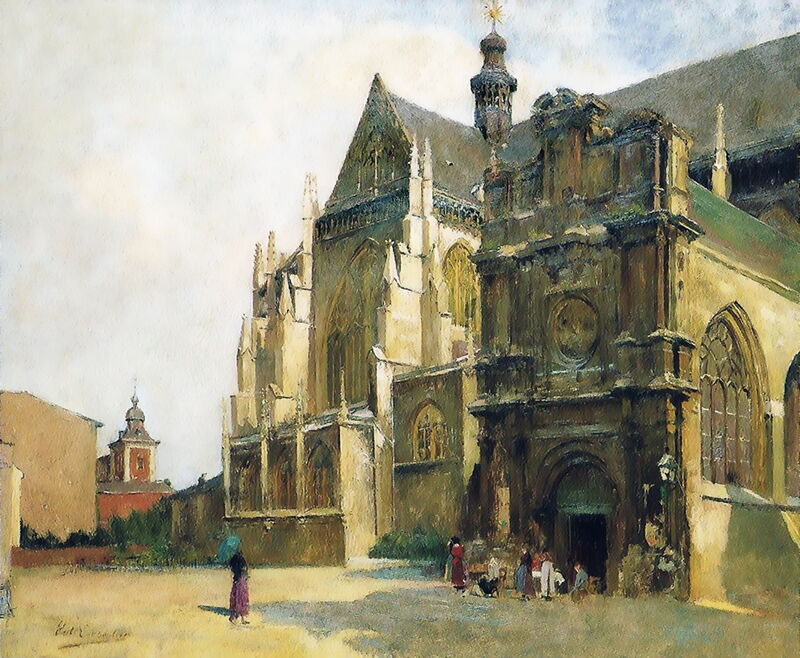 In about 1900, Carpentier painted a series of works showing churches and related buildings in Liège, including this view of the Place Saint-Jacques in Liège. Six of these are now in the Prince-Bishops’ Palace of Liège, which was itself one of his subjects. 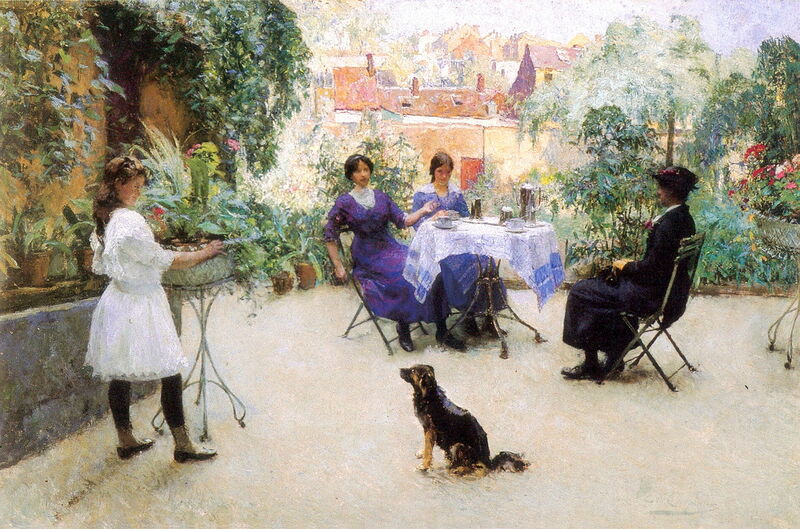 Évariste Carpentier (1845–1922), First Beautiful Days (c 1900-03), oil on canvas, 82 x 103 cm, Private collection. Wikimedia Commons. First Beautiful Days from about 1900-03 is probably another Impressionist view of his wife seated with the city of Liège as the backdrop. In 1904, Carpentier became director of the Royal Academy of Fine Arts in Liège, a post from which he retired fifteen years later. These last four paintings are all undated, but were most probably completed in the early years of the twentieth century, judging by their loose facture and Impressionist style. Sunset at Ostende shows the seafront of this Belgian resort at the southern end of the North Sea, looking towards the setting sun to the west. Évariste Carpentier (1845–1922), Girl and her Greyhound in the Garden (date not known), oil on canvas, 59 x 49 cm, Private collection. Image by Cafedelyon, via Wikimedia Commons. 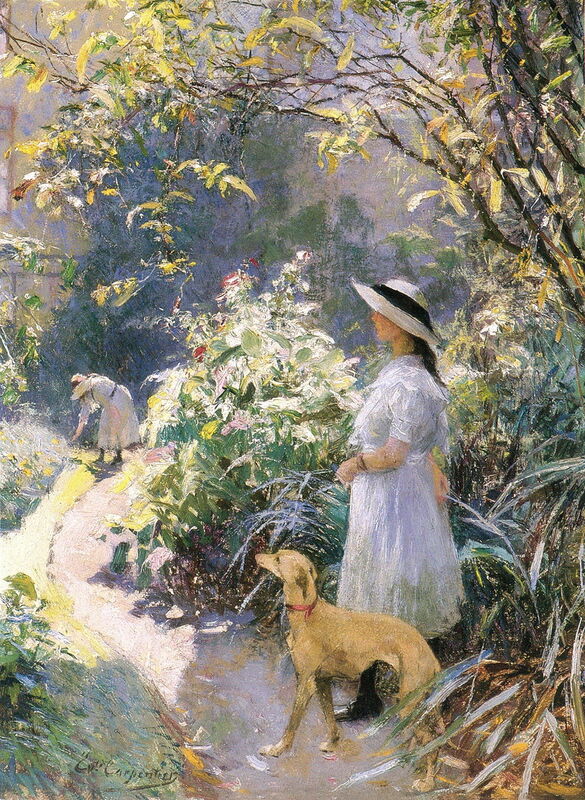 Carpentier painted several works showing girls and young women in gardens, including this one of a Girl and her Greyhound in the Garden. Évariste Carpentier (1845–1922), Ladies Taking Tea (date not known), oil on canvas, 65 x 100 cm, Private collection. Image by Cafedelyon, via Wikimedia Commons. Ladies Taking Tea shows a group of young women, possibly his daughters, taking tea on a small terrace in a town. 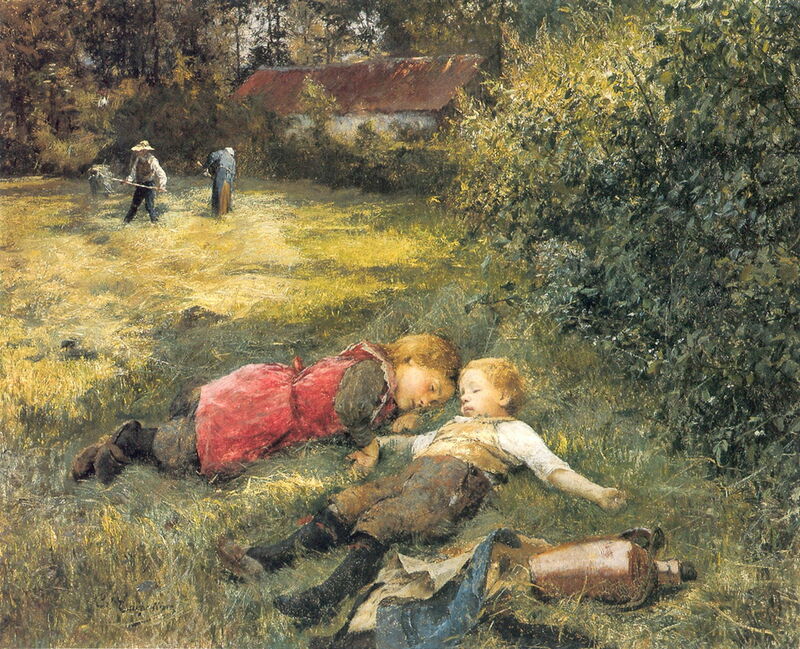 Évariste Carpentier (1845–1922), Children Asleep (date not known), oil on canvas, 71 x 90 cm, Private collection. Wikimedia Commons. Children Asleep is more sentimental again, with two young children asleep by a hedge as their parents are cutting hay in the field. Évariste Carpentier (1845–1922), Kempen in August (date not known), oil on canvas, dimensions not known, Private collection. Image by Cafedelyon, via Wikimedia Commons. Finally, De Kempen in August was painted in a heathland and wetland area on the border betweem the Netherlands and Belgium, to the east of Antwerp. It’s known as Campine in French, or De Kempen in Dutch, and lies to the east of Antwerp. Among the cattle and people is a woman artist, who has set up her easel to paint under a small white parasol. Carpentier’s painting productivity declined after his retirement in 1919, and he died in 1922 after a long illness. He had been prolific, successful, and had been a dedicated teacher. However, with the changing tides of art in the early twentieth century, his work was quickly forgotten until interest in it revived in the later years of the century. Posted in General, Life, Painting and tagged Carpentier, Impressionism, painting, plein air. Bookmark the permalink. Howard, dammit, I had plans for today! I can study these paintings for hours. His diagonals and meanderings… was he being intentional in his messages, do you think? Or is it the genius of the artist coming through. Please don’t misunderstand me; the painterly aspects, subjects, and colors make me want to ditch my housework (and possible even my grad school hopes) and just paint. Good on ditching the housework, but don’t compromise your grad school hopes, please! I’m glad that you found them worthwhile.